Earlier this year when I was in New York visiting the Hachette offices, the incomparable Kelly Leonard suggested this book as an absolute page turner. I was glad to leave with a copy of the galley that day, but unfortunately I didn't really get a chance to read it until this past weekend when I went out of town. I had a red-eye flight and hadn't really slept the night before either. I was trying to read Frederick Buechner's Godric and that wasn't really working either--it's a book that requires a lot of concentration. So I grabbed this one to stay awake while waiting for my connecting flight. I was sucked into the narrative right away and it was the absolute right choice. 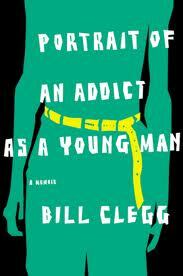 Portrait of An Addict as a Young Man is the memoir of literary agent Bill Clegg and his addiction to cocaine. What I appreciated about the book is the way it sucked me in immediately...I instantly felt that drive for the next hit and sense of paranoia and desperation that clouds the drug addicted mind. Clegg tells his story in a non-linear fashion mixing up point of view in order to establish the brokenness in his life that led him to become an addict. He doesn't really make excuses for what he did, but rather explains the life of an addict. I think that what further made this memoir a hit with me is that nothing is explicit. I'm sure most addicts would agree there are strong commonalities in their experiences. The surface details might be different but their paths of addiction often look similar. This is all present in Clegg's narrative, but it's not explicitly called out. It's very much a memoir from the inside of the experience detailing the days he blew through 70,000 dollars, dissolved his business partnership, left his clients in the lurch, and hit rock bottom, through the days of getting his life back together which are a much shorter part of the book. Because Clegg is a literary agent, there's even a touch of the role books play in our lives, how they first came to mean something to him. The quality of the writing is lovely, again, I very much felt this memoir. I've heard some criticism since reading it (and yes I did google the author to find out more upon finishing) that it doesn't add anything new to the addiction memoir. I have no thoughts on that, this is the one I read.